4-Anne Reid was born on 1 Jun 1818 in Edinburgh Castle, Edinburgh, Midlothian, Scotland and died on 28 Apr 1846 in Earlston, Berwickshire, Scotland at age 28. Anne married Thomas Scott, son of George Scott and Elizabeth Pringle, on 21 Dec 1835 in Launceston. Thomas was born in 1800 in Hawthornside, Roxburgshire, Scotland and died on 3 Mar 1855 in Earlston, Berwickshire, Scotland at age 55. After completing his qualifications as a surveyor Thomas emigrated to Van Diemen’s Land, arriving in Hobart Town in 1820 on the Skelton. In 1821 he was appointed by Governor Lachlan Macquarie as assistant surveyor under the deputy surveyor general, George Evans. He was very active and was responsible for surveying much of the early settlements. Between 1822 and 1824 he explored parts of the east coast and laid out the town of Bothwell. During the 1820s he took up the Mount Morriston estate on the Macquarie River near Ross. When George Evans retired in 1824 Thomas applied for the vacancy but when Governor Ralph Darling called at Hobart on his way to Sydney he appointed his brother-in-law, Edward Dumaresq , as acting surveyor general instead. Lieutenant-Governor George Arthur confirmed the appointment, but reported that he was satisfied with Scott's zeal and abilities and asked that his salary be increased. The Colonial Office then appointed Scott as surveyor-general, but Arthur later changed his mind about Scott's honesty, because of complaints that had been made about him and George Evans. They had both been accused of taking bribes to measure holdings in excess of land areas actually granted. The Executive Council inquired into these charges and found that both surveyors were at fault, but Scott was excused for the errors of his senior officer. George Frankland was then appointed Surveyor-general while Dumaresq acted as chief land commissioner and Thomas Scott continued as assistant surveyor. In 1826 Thomas took a party to Adventure Bay and South Cape to explore coal seams, where he established friendly relations with the local Aborigines. He later examined Port Arthur as a place for a settlement. He next accompanied Lieutenant-Governor Arthur on an expedition from Hobart to Mole Creek and through the Van Diemen's Land Co.'s land at Middlesex Plains, Surrey Hills, Hampshire Hills and Emu Bay. In 1830 he was promoted to senior assistant surveyor. In 1832 he became surveyor for the County of Cornwall. He also took up residence at Bowhill, Glen Dhu, Launceston. In 1833 Thomas was moved to George Town. In 1835 he married Ann Reid and then arranged to visit Scotland, having first arranged for his brother James to be his deputy and to share his salary of £350. Upon his return he resigned and devoted himself to his own land and personal business interests. By the time of his death in Earlston, Berwickshire, Scotland had amassed a huge fortune, estimated at £107,800. George Pringle Scott was born on 7 Oct 1837 in Earlston, Berwickshire, Scotland and died on 19 Aug 1843 in Earlston, Berwickshire, Scotland at age 5. Thomas Scott was born on 1 Apr 1839 in Gattonside Villa, Melrose, Roxburgshire and died in 1843 at age 4. James Reid Scott (1839-1877), explorer and politician, was born on 1 April 1839 at Earlston, Berwick, Scotland, died on 25 Aug 1877 in Carolside, New Town at age 38, and was buried on 29 Aug 1877 in St John's Church, New Town. Educated in Scotland, he arrived at Launceston with his younger brother in 1856 to live with his uncle James , who taught him surveying. On 26 April 1860 at St David's Cathedral, Hobart Town, he married Elizabeth Sarah Evans. He was made a justice of the peace in 1865 and in 1866-72 was a member of the House of Assembly for Selby. Scott was a member of the 1869 royal commission on distillation which, despite opposition by the Tasmanian Temperance Alliance, advocated distillation of spirits in Tasmania to encourage the market for local grains. He was chairman of committees in 1871-72 and a member of the select committee inquiring into Port Arthur, which recommended the settlement's closure and accommodation of the prisoners at Hobart and elsewhere. He helped in the downfall of the (Sir) J. M. Wilson ministry in 1872 and was called on to form a new government, but declined. 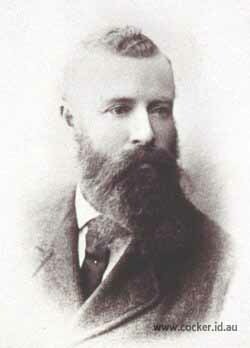 In 1872-77 he represented South Esk in the Legislative Council and held the portfolio of colonial secretary in 1872-73. During his parliamentary career he won repute as an honest, independent politician, courteous and unobtrusive and capable in administration, whose principal concern was the welfare of the colony. From 1873 Scott gave much time to exploration, made several visits to lesser-known areas of the west and south-west, and prepared a number of papers for the Royal Society of Tasmania, to which he had been elected a fellow in 1868. In 1876 he reported to the minister for lands and works on 'Exploration in the Western Country', concerned chiefly with opening access tracks in western areas to encourage prospecting and mineral development. His last trip was made in March and April 1877 to the Pieman River and other places, during which he named Mount Tyndall after the scientist, and lakes Dora and Spicer after Hobart friends. He was later described as a good botanist and a hardy and enthusiastic explorer. The first recording of Branxholm was in 1852, as James Scott made his way through from Launceston to Cape Portland. A few years later when Scott himself settled in Legerwood his nephew James Reid Scott selected land nearby and named it Branxholm Estate. James died suddenly of congestive apoplexy at Carolside, his New Town home, on 25 August 1877. When he was buried at old St John's Church, New Town, on 29 August all Hobart government offices closed from noon; mourners at his funeral included the premier, colonial secretary and colonial treasurer; 'His Excellency's carriage followed'. His estate was sworn for probate at £8252. THE HON JAMES REID SCOTT, M.L.C. On Monday afternoon an inquest was held before Mr Tarleton, at the Maypole Inn, New Town, to ascertain the cause of death of Mr James Reid Scott. Accord ing to the evidence of the gardener, at Carolside, Mr Scott was in his garden several times on Saturday afternoon, and at near 5 o'clock he planted a flower in it with his own hands. He appeared to be in his usual good state of health. He was seen passing into the house, and to his library, soon after setting the flower, about half-past 6 o'clock, Mrs Scott called her servant. Mary- Ann Chapman, into the library, and there she saw Mr Soott lying on his right side on the floor, his feet near the study chair. She went to move him. and saw he was black in the face. Mrs Scott sent her for Mr Evans. and, after he arrived, bottles of hot water were put to Mr Scott's feet, and the neck of his thirt was unbuttoned. Dr. Bright, who had been sent for, arrived soon after, and an announced that there was no hope of recovery, as Mr Scott was dead. Dr. Bright believed from the peculiar livid appearance of the face, indicating that the blood vessels of the brain were gorged, that the cause of death was apoplexy. The jury, on hearing the evidence of Dr. Bright, did not consider a post mortem examination or the attendence of Mrs Scott necessary, -They returned A verdict to the effect, that Mr Scott died during a fit of aongestire apoplexy. The funeral to leave Carolside for St John's Church, New Town, at half -past 3 o'clock to-day, and by General notice the public offices at Hobart Town, are to be closed to-day as a mark of respect to the memory of the deceased gentleman, formerly - Colonial Secretary of this colony, and member of the Exetutive and Legislative Councils. James married Elizabeth Sarah Evans, daughter of Michael Evans and Dinah Mary May, on 26 Apr 1860 in St Davids Church, Hobart. Elizabeth was born on 29 Jun 1842 and died on 22 Feb 1927 at age 84. They had eight children: Violet Agnes, Florence May, Thomas Perry Arthur, Eleanor Mabel, Michael Charles, Janet Laura, Walter and George. 6-Violet Agnes Scott was born on 26 Apr 1860 in Hobart, Tasmania. Violet married Alfred Fullarton Sharland, son of William Stanley Sharland and Frances Sarah Schaw, on 17 Jul 1888. 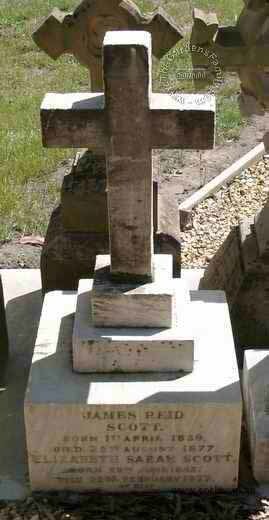 Alfred was born on 26 Jan 1857 and died on 14 Apr 1929 at age 72. Application was made to Mr. Justice Ewing yesterday to make absolute a decree nisi granted in April last to Alfred Fullarton Sharland, grazier, of Hobart, on the ground of desertion by his wife, Violet Agnes Sharland, the respondent Mr A E Richardson, who made the application, said that there had been no intervention of any kind to prevent the decree being made absolute His Honor granted the application. Violet and Alfred had five children: Florence Eva, Marion Clara, Errol Fullarton, Michael Stanley Reid and Arthur Bernard. 7-Florence Eva Sharland was born on 25 Nov 1890 in Ringarooma and died on 15 Nov 1975 in Sydney, New South Wales at age 84. 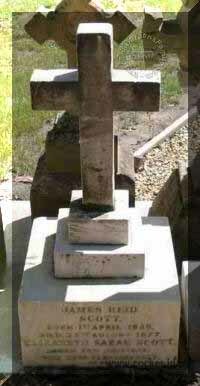 Florence married Ernest Waldegrave Tait on 21 Jun 1914 in St. Lukes Church, Campbell Town. Ernest was born on 16 Feb 1879 in Melbourne, Victoria and died on 8 Nov 1952 in Sydney, New South Wales at age 73. They had two children: John Denzil Sharland and Brian Sharland. 8-John Denzil Sharland Tait was born on 16 Apr 1916 in Killara, Sydney, New South Wales and died on 10 Nov 2006 in New South Wales at age 90. John married Hazel Forward Adams in 1942 in Chatswood, New South Wales. Hazel was born in 1911 in St Leonards, New South Wales and died on 4 Nov 2009 in New South Wales at age 98. 8-Brian Sharland Tait was born on 13 Jan 1918 in Killara, Sydney, New South Wales and died in Oct 2002 in Gloucester, Gloucestershire, England at age 84. Brian married Marjorie Joan Lawrence in 1944 in Gloucester, Gloucestershire, England. Marjorie was born on 2 Feb 1922 in England and died in Aug 1993 in Gloucester, Gloucestershire, England at age 71. 7-Marion Clara Sharland was born on 14 Apr 1892 and died in 1972 at age 80. 7-Errol Fullarton Sharland was born in 1894 and died in 1969 in New Zealand at age 75. 7-Michael Stanley Reid Sharland was born on 14 Jun 1899 in Bellerive, Tasmania and died on 24 Jan 1989 in Hobart, Tasmania at age 89. Michael Stanley Reid Sharland, one of the old school of bird students, a senior member of the Royal Australasian Ornithologists Union and a past office-bearer of the Tasmanian Field Naturalists Club, died at Hobart on Wednesday, 11 February 1987 at the age of 87 years. He was a man of many parts with a deep history in his native State of Tasmania as well as in ornithology as a whole, and he was one of Australia's foremost photographers with wonderful photos of birds and historical subjects. He was a journalist by profession, although in more recent times his chief concern was the maintenance of our historical heritage as former secretary of the Scenery Preservation Board. This work included the restoration of several buildings as part of the convict settlement of Port Arthur and the old home "Entally" as Hadspen, which was one of his dearest loves. Tasmanian national parks also came under his control. His early training in journalism was with Hobart's daily paper, "The Mercury", with which he was closely associated for over sixty years, and he has always been highly regarded in that field. In 1927, he transferred to "The Sydney Morning Herald" before moving again to Melbourne where he was employed by "The Argus" and for a short time also as a correspondent of Reuters in London. It was in his very early days at Campbell Town in the Tasmanian Midlands that he took a keen interest in natural history, particularly in birds, and it did not take him long to bring his knowledge in this field to the attention of "The Mercury" , as a result of which he started contributing a column under the name of "Peregrine" to that paper's weekly magazine, "The Illustrated Tasmanian Mail", and this continued in Saturday's "Mercury" after the magazine ceased publication in about 1931. "Peregrine's" nature notes continued without a break for 60 years, which is believed to be a record. During World War II he served as Chief Photographer with the Australian Paratroop Battalion. On the cessation of hostilities, he returned to Tasmania and his old friends at "The Mercury" for a brief period before accepting the position of Secretary to The Scenery Preservation Board which he held from 1947-1961. During this time he also held appointments as a member of the I 8 Tasmanian Naturalist October 1987 Animals and Birds Protection Board, the Nomenclature Board and as Honorary Ornithologist to the Tasmanian Museum. In addition to his other posts, he took an active interest in the Royal Zoological Society of N.S.W. whilst he resided in Sydney and was elected a Fellow of that Society. On his return to Tasmania he was instrumental in rejuvenating the Tasmanian Field Naturalists Club and in 1 971 in the formation of the Bird Observers Association of Tasmania. He was elected a Life Member of both these bodies. Michael Sharland was a regular contributor to "The Emu" for many years and his papers were often illustrated with his excellent photographs which became well-known. In later years, he won two international awards with his bird photographs which were always in black-and-white. He claimed that this medium allowed him greater definition and character. He also wrote articles for the "Tasmanian Naturalist", "Gould League (N.S.W.) Notes", "Australian Museum Magazine", "The Bird Observer" and" Australian Bird Watcher", and for the now-defunct magazines "Wildlife" and "Walkabout" . Not only was he a regular contributor to "The Emu", he also acted as Tasmanian State Secretary of the R.A.O.U. from 1945-1963 and as such was a member of Council. He was President of the R.A.O.U. during 1949-1951. He undertook the following expeditions in connection with his ornithological pursuits:- 1924 - Lake Eyre (4 months) 1926 - Lord Howe Island (2 months) 1947 - Kimberleys (6 months) 1948 - Great Australian Bight Islands (1 month) 1967 - Cape York. Additionally, he made a number of overseas visits, primarily for family reasons, but always paying close attention to natural history subjects. These included United Kingdom, Europe, North and South America, Africa and New Zealand. He was the author of the following books:- Tasmanian Birds (1945, 1958, 1981); Stones of a Century (1952); Tasmanian Wild Life (1961); A Territory of Birds (1964); Tasmania (1966); Oddity and Elegance (1966); Birds of the Sun (1967); These Verdant Plains (1971); Tasmanian National Parks (1972); Once Upon a Time (1976); and Tracks of the Morning (1981 ). His official duties with the Tasmanian Field Naturalists Club included: President (1945-1948; 1954-1955), Vice President (1922-1924; 1949-1953; 1965-1972), Honorary Secretary (1941-1942) and Editor of the Tasmanian Naturalist (1946-1950; 1965-1968). Our sympathies are expressed to his wife, Iris, who often accompanied him on his excursions, his son, Roger, and his daughter, Elizabeth. Biographical entry Sharland, Michael (1899 - 1987) Born 14 June 1899 Bellerive, Tasmania, Australia Died 11 February 1987 Hobart, Tasmania, Australia Occupation Naturalist, Journalist and Ornithologist. Michael married Iris Kettlewell on 14 Mar 1928 in St Davids Cathedral, Hobart. Iris was born in 1905 in Hobart, Tasmania and died in 1988 at age 83. They had two children: Roger and Elizabeth. 6-Florence May Scott was born on 21 Dec 1864 in Launceston. 6-Thomas Perry Arthur Scott was born on 4 May 1867 in Hobart, Tasmania and died on 9 Apr 1873 in Hobart, Tasmania at age 5. 6-Eleanor Mabel Scott was born on 4 Oct 1870 in Hobart, Tasmania. 6-Michael Charles Scott was born on 22 Feb 1872 in Hobart, Tasmania and died on 30 Apr 1941 in North Sydney, New South Wales at age 69. The death occurred In Sydney last Saturday of Mr. Michael Charles Scott, eldest son of the late Mr. and Mrs. J. R. Scott, of Hobart. Mr. Scott was educated at the Hutchins School, Hobart, and had lived In Sydney many years. He was on active service with the A.I.F. in the First World War, and was gassed badly. He had been in Indifferent health for some time. Scott-Hopson - On May 28, 1894, at St. Mark's, Kensington, London, Michael Charles, eldest son of the late James Reid Scott, to Ella, daughter of the late Edward Hopson, Esq., Bayswater, London. The marriage is also registered in England Jun 1894, 1d 517. Michael married Ella Hopson on 28 May 1984 in London, England. Ella was born about 1873 in London, England and died on 16 Dec 1920 in Crows Nest, New South Wales at age 47. 6-Janet Laura Scott was born on 13 Jun 1873 in Hobart, Tasmania. 6-Walter Scott was born on 18 Sep 1875 in Hobart, Tasmania. Walter married Alice Maud Smith. They had two children: Arthur Reid and Gerald Reid. 7-Arthur Reid Scott was born on 30 Mar 1902 in Sandy Bay and died on 16 Feb 1985 in Morvya, New South Wales at age 82. Arthur married Lillian Mayo Burbury, daughter of Sydney Burbury and Elsie May Hood, on 5 Jan 1927 in St Peter's Church, Oatlands. Lillian was born on 2 Jan 1906 and died on 1 Sep 1994 at home, Turosso Heads, New South Wales at age 88. They had five children: Michael Reid, Robert David Reid, Alan Reid, Eleanor Anne Lillias Reid and Sylvia Elsie Reid. 8-Michael Reid Scott. Michael married Jill Bryan Duffy. They had four children: Roderick Thomas Reid, Alison Jane, James Michael Reid and Prudence Jane. 9-Alison Jane Scott. Alison married Craig McNeil Cunningham. They had one son: Alistair Macmillan. 9-Prudence Jane Scott was born on 26 Nov 1962 and died on 15 Dec 1962. 8-Robert David Reid Scott. Robert married Diana Salmon. They had three children: Jacqueline Edith Reid, Megan Elsie Reid and Adam Walter Reid. 9-Jacqueline Edith Reid Scott. Jacqueline married Michael David Bramwell. They had three children: Freya Jane, Grace Anna and Elsa Louise. 9-Megan Elsie Reid Scott. Megan married Warren Robert Wood. They had three children: Matthew Robert, Bradley Scott and Lachlan Heath. 9-Adam Walter Reid Scott. Adam married Kerris Power. They had two children: Ciara Anne Reid and Aodhan Thomas. 8-Alan Reid Scott. Alan married Claire Bald. They had one daughter: Samantha. 9-Samantha Scott. Alan next married Laura Lee Argyros. They had two children: Leila Rose and Nicholas Ashoka. 8-Eleanor Anne Lillias Reid Scott. Eleanor married Barry Bjorksten. They had four children: Penelope Ann, Igor Lachlan, Gustaf Alun Arthur and Alun D'mitri. 8-Sylvia Elsie Reid Scott. Sylvia married Horst Lerch. They had four children: Anna Jane, Ingrid Elsie, Michael Lloyd and Jennifer Mayo. 7-Gerald Reid Scott was born on 11 Sep 1904 in Sandy Bay and died on 20 Nov 1976 at age 72. Gerald married Jean Alison Burbury, daughter of Sydney Burbury and Elsie May Hood, on 3 Jun 1933 in St George's Church, Hobart. Jean was born on 19 Aug 1908 and died on 11 Dec 1994 at home, 12 Lakeside Dr., Wagga Wagga, New South Wales at age 86. They had four children: Bettina Reid, Margaret Reid, Judith Reid and Nancy Reid. 8-Bettina Reid Scott. Bettina married Alistair Joseph Maskelyne. They had three children: Angela, Douglas and Susan. 9-Angela Maskelyne. Angela married Michael Fatouris. They had two children: Michael and Nicholas. 9-Douglas Maskelyne. Douglas married Kathleen Durkin. They had three children: Shone Anne, Damon Michael and Kieran Edward. 9-Susan Maskelyne. Susan married Roger Brittain Green. They had three children: Julia Scott, Spencer Brittain and Frazer Brittain. 8-Margaret Reid Scott. Margaret married Digby Foster. They had three children: Andrew, David and Richard. 8-Judith Reid Scott. Judith married David Wood. They had three children: Jennifer, John and Roger David. 9-Jennifer Wood. Jennifer married Marcus Bader. They had one daughter: Amanda. Jennifer next married Noel Snowden. They had one daughter: Brooke. 9-John Wood. John married Natalie Post. 9-Roger David Wood. Roger married Catherine Louise Turner. They had one daughter: Nicola Burbury. 8-Nancy Reid Scott was born on 15 Mar 1934 and died on 5 Oct 1995 at age 61. Nancy married Peter Harbin. They had two children: Deborah and Claudia. 9-Claudia Harbin. Nancy next married Donald Wharton. They had one daughter: Alexandra Geraldine Burbury. 6-George Scott was born on 18 Apr 1877 in Hobart, Tasmania. George Thomas Scott was born on 16 Oct 1843 in Earlston, Berwickshire, Scotland.